Peter Beales Roses have been passionate about roses since 1968, when Peter opened his first rose nursery. 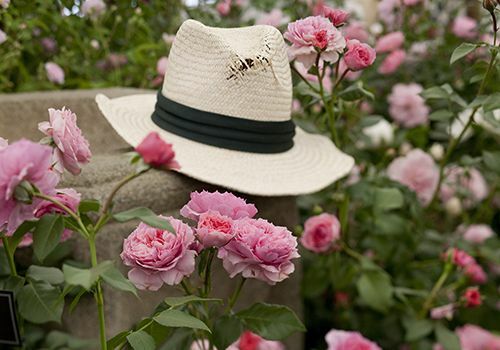 Since then Peter Beales Roses have become renowned around the world for specialising in the preservation of old fashioned, historic and rare roses, as well as winning many prestigious awards, including 25 Gold medals at the RHS Chelsea Flower Show. Click here to find out more about our successes at the RHS Chelsea Flower Show. Nursery Manager Ian Limmer started working for Peter Beales Roses as a Saturday boy in 1977 and it wasn’t long before Peter saw the potential within Ian, asking him to become part of the show build up team at the Chelsea Flower Show, gaining the experience needed to create an award winning colour coordinated display. Ian studied part-time for 3 years at a local Horticultural College. After which, he progressed on to do a three year apprenticeship at the nursery, working alongside Peter gaining further horticultural experience, whilst at the same time passing on his passion for old fashioned roses. As Ian’s knowledge grew, Peter encouraged him to visit customer’s gardens, to give advice and help plan smaller gardens. Today, with Ian’s breadth of knowledge, Ian is more than happy to undertake any garden design project. As Peter grew older and wasn’t able to travel as much, he would send Ian all over the world to visit gardens or to give lectures. Visiting many impressive gardens around Europe and lecturing as far as field as Japan. 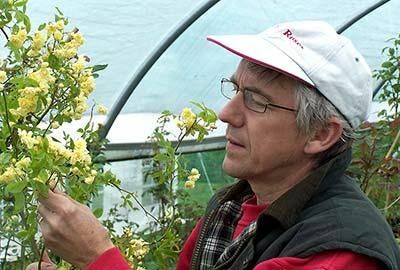 Ian also writes articles, leads workshops, demonstrations, garden tours and heads the hybridizing programme at Peter Beales Roses, selecting the best seedlings which will go on to become new releases. To follow Ian's blog please click here. Peter Beales Roses are the World Leaders in Classic Roses and also have other garden centre products and a full range of plants. Since 1968, Peter Beales Roses have grown millions of roses, from shrub, climbing to modern hybrid and floribunda roses that are now growing all over the world, from small city gardens in London to hundreds of acres in Japan. All roses and plants are lovingly cared for by hand by our East Anglian based rosarians over two years before they are sold. Many growers of roses, outsource the growing of their roses to Eastern Europe, or keep their roses in cold store late into the spring and early summer - both practises, we believe, lead to inferior roses and disappointing results. Peter Beales' roses are all grown in East Anglia tended for by local, expert nurserymen with many years' experience. Roses come in two main forms: bare root roses in the winter and containerised roses throughout the summer. Bare root roses are perfect for winter planting and arrive between November and March, whilst the roses are dormant and can be safely transported with roots exposed. Bare root roses are perfect for mass plantings where handling large plants would cause a problem with planting distance. All of our 1100+ roses are available in bare root form throughout the winter. Container roses are potted in the autumn/winter and sold from late spring, they often arrive to the customer in bloom, laden with flowers and as such, are perfect as presents or when instant results are needed. Not all roses lend themselves to containerising, so only around 400 varieties of our roses are available each year. All roses look great in blocks of three, which is why many roses are available from Peter Beales Roses with multibuy discounts. Here at Peter Beales we also believe in offering our customers a wide range of complementary high quality companion plants, from clematis to lavender the selection of genus is vast. To read more about our specialist rose and plant centre at Attleborough, Norfolk please click here.